On the back streets of Melbourne’s bustling northern suburb of Fitzroy sits the family residence King Bill, a pastiche of humble materials that binds together a two-storey terrace, rear stable and empty garden site. 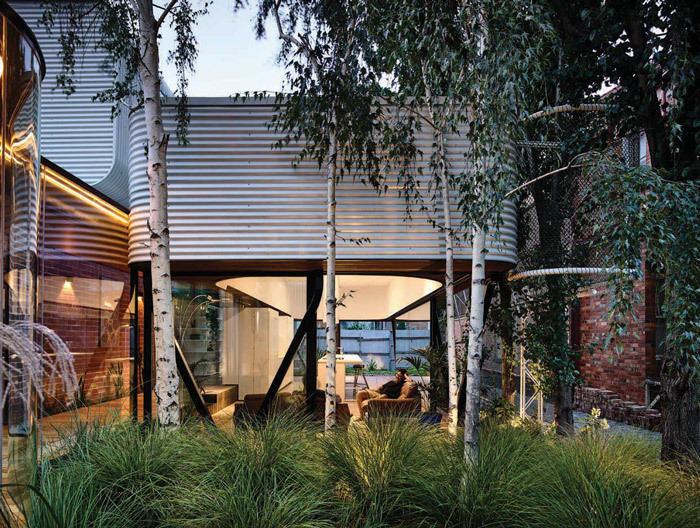 With its practice based just around the corner, Austin Maynard Architects conceived the house as an ode to Fitzroy — in its words, ‘its textures, its forms, its order and its chaos’ — celebrating the pulse of the suburb, while elevating the experience of home as something joyful and spirited. Also long-standing Fitzroy locals, the clients consciously eschewed capitalising on the block in favour of giving something back to the neighbourhood. With rows of decadent brick terraces, weatherboard cottages, post-war stud-veneer homes and Sixties’ flats sitting against corrugated sheds, factories and repurposed warehouses, the boom and bust history of Fitzroy is written in the diversity and eclecticism of its built fabric. Peppered across Fitzroy’s dense residential landscape, ‘pocket parks’ offer green relief to streetscapes like gap teeth. In a strong civic gesture, King Bill is pulled from its northern boundary to present a rich and generous garden to the street; its own pocket park of sorts, complete with a red-brick barbecue plinth, a mandate of the Australian home. Such a gesture came up against bureaucratic obstacles, however: though the garden was intended to be publically accessible, heritage restrictions dictated that the existing corrugated fence had to be retained. Andrew Maynard, co-director of the practice, explains that an application to remove the fence is being submitted, so the garden will hopefully take on more of a public interface (as per the design intent) in the future. Austin Maynard Architects approached the terrace, stable and vacant block as a series of volumes that needed new purpose, providing additional and improved living space for the family of four. Openings are punched through the terrace’s eastern boundary wall, where a sunlit, meandering corridor finished with warm, honeyed-tone timber links the terrace to the existing rear stable and a new eastern extension. Recognising the heritage significance of the area, the facade of the 1850s terrace remains untouched while the internal spatial programming gives the house greater clarity and purpose. The former kitchen has been converted to a sizeable laundry, with a music room and deck to the south, a centralised lounge and a guest room and bathroom to the north playfully occupying the former entry. The existing stair has been cut back and twisted with the introduction of new white steel treads and a timber plinth, while a perforated screen casts dappled light as one journeys upstairs. Here vibrant carpet colours give identity and ownership to the children’s private spaces and the shared ‘demilitarised’ zone between. Taking on a playful caravan-like exterior, a small addition to the south houses an elevated bed niche lined with woven vinyl; a sunny alcove to rest and relax (‘A successful space is one where the cat is sleeping,’ Maynard comments.) Two sizeable window portals direct views across the pebbled rooftop of the extension to Fitzroy’s suburban skyline. At the heart of the project is a garden pavilion, housing kitchen, living and dining spaces — the hub of the family home. In contrast to the robust and self-contained ‘brick box’ terrace, the Y-framed steel and glass pavilion is highly permeable, facilitating a greater connection to the outside. 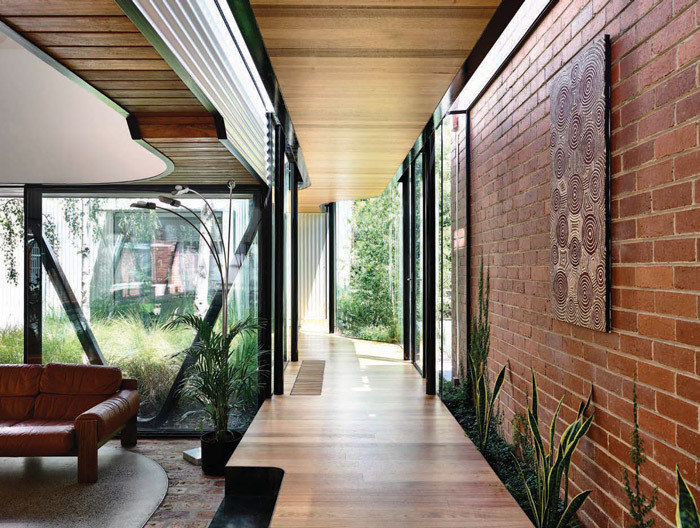 Exterior brick paving and a timber-clad soffit creep into the interior, obscuring the thresholds of inside and out, while frameless, operable corners allow the living space to be opened to the garden, forging a casual indoor/outdoor Australian sensibility. The new slab cantilevers over its steel footings to protect the site’s established pear and silver birch trees that are gently bound to the house with a curved ribbon of chain-link fencing. Clear visibility to the site’s eastern boundary gives the pavilion room to breathe while reaffirming the democratisation of King Bill’s garden to its suburban context and community. 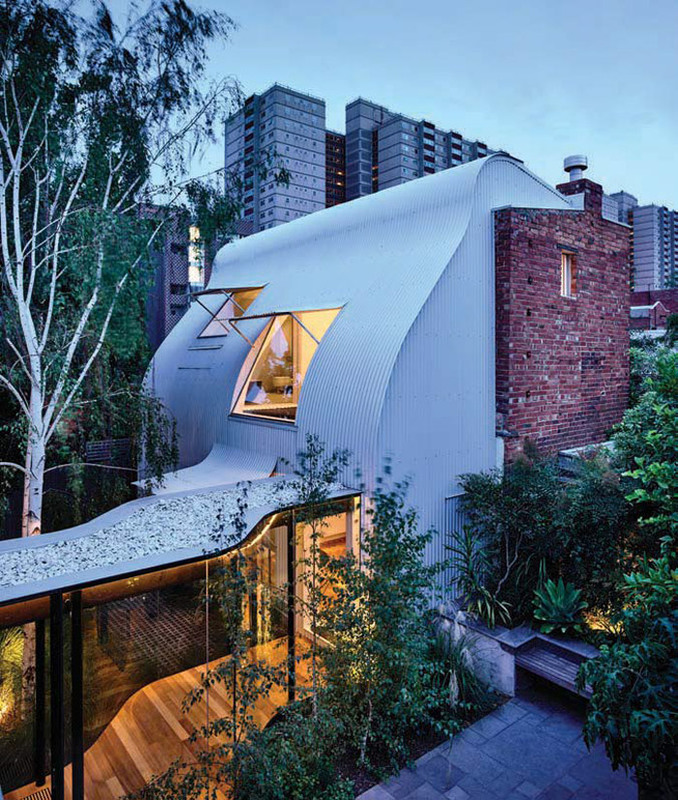 Beyond, a native garden fills the negative space to the rear existing stable, accessed via a sinuous glazed bridge, a continuation of the entry spine. Conceived as a parents’ retreat, the stable contains a stacked car garage, study, master bedroom and bathroom concealed behind a sweeping veil of white custom orb. This facade is punctured with openings that peel back against the wind, directing views towards the pavilion and offering quiet moments of reflection and respite. Ascending to the upper level via a tight spiral stair, the bedroom’s orange carpet adds an unexpected punch of colour. The curved roof line gives a sense of spatial compression along the northern edge, offering an intimate bathing area filled with natural light. A heavyweight net fills the void to the lower level, mitigating the need for a balustrade while staging a playful space to read, relax or delight in the treetops. The distinguishing and unifying feature of King Bill is the corrugated metal cladding that defines each addition; the sweeping curtain of the stable, the water tank-like shroud of the glass pavilion and the ‘caravan’ bedroom addition draw focus to the architects’ thoughtful interventions. The supporting palette of utilitarian materials is a nod to Fitzroy’s industrial heritage and accentuates the diversity, grit and grain of the suburb’s urban fabric and material profiles. Like much of Austin Maynard Architects’ primarily residential work, King Bill has the tenets of a well-designed suburban dwelling with sustainability at its core. Passive solar principles maximise daylight and optimise solar gain in winter, while demands on mechanical heating and cooling are drastically reduced with active management of shade and passive ventilation. All roof water is captured and reused, with a large water tank buried within the rear yard, while the terrace’s roof is covered with solar panels. The house effectively stitches together the spatial conditions of the site through shared materials, vistas and a unified design sensibility. 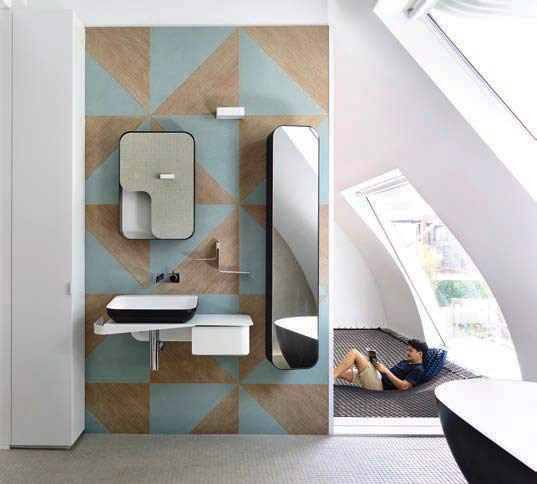 By rethinking the terrace-house typology, the new sequencing of the home allows the family to choose its level of social engagement with visitors. A variety of spatial atmospheres is presented, giving flexibility and choice for individuals to occupy areas that best suit their mood — a recurring theme in Austin Maynard Architects’ projects.